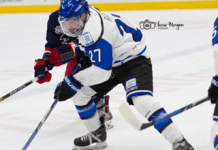 (ISN) – Prince Albert, SK— 20-year old forward Dakota Conroy has returned home to Edmonton and has subsequently been suspended by the Prince Albert Raiders. Conroy has had a tough start to the season playing in 10 regular season games with just 1 goal and 1 assist, a -6 rating and 9 penalty minutes. “We are disappointed with Dakota’s decision but will respect it however, we will also do what is appropriate for our organization and suspend him effective immediately,” Bruno Campese, Raiders General Manager.